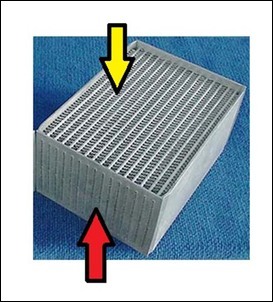 There are two fundamentally different types of intercoolers – air/air and water/air. In this story we’ll take a look at building your own water/air design. But first – why take a water/air approach in the first place? Water/air intercooling is used less frequently than the air/air approach. However, it has several benefits, especially in cramped engine bays. 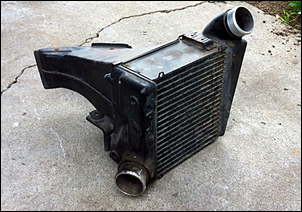 A water/air intercooler uses a compact heat exchanger located under the bonnet and normally placed in-line with the compressor-to-throttle body path. The heat is transferred to water that is then pumped through a dedicated front-mounted radiator, cooled by the airflow generated by the car's movement. A water/air intercooler system consists of these major parts: the heat exchanger, radiator, pump, control system, and plumbing. Water has about four times the specific heat of air. So for each increase in temp by one degree, the same mass of water can absorb some four times more energy than air. Or, there can be vastly less flow of water than air to get the same job done. The high specific heat value of water has a real advantage in its heat sinking affect. An air/water heat exchanger designed so that it has a reasonable volume of water within it can absorb a great deal of heat during a boost spike. Even before the water pump has a chance to transfer in cool water, the heat exchanger has absorbed considerable heat from the intake airstream. But on the downside, the complete water/air system is usually heavier and more expensive than an air/air design. So, overall, how does water/air compare with air/air? In short, if you have a car where it would be hard to fit in an air/air core, or the plumbing path to the air/air core would get very long, water/air is a viable alternative. That’s especially the case for street-driven cars. The availability of water/air heat exchangers, dedicated water/air radiators and good 12V pumps has changed dramatically in the last few years. All of these parts are now readily available (e.g. on eBay) and so putting together a water/air system can be as simple as selecting the right heat exchanger, pump and radiator. Add some hoses, connect power - and you’re done! So why would you want to build your own? The primary reason is that you can configure the system to exactly suit your requirements. For example, you can specify the core size, the position and diameter of the inlet and outlet tubes, where the water fittings are located – and so on. There’s another reason too. Above we described how the water that is sitting in the heat exchanger core can absorb the heat from the intake air – so acting as a heatsink. But it can do that only if there is enough water there! Most commercially available water/air cores are built around air/air cores. Trouble is, in many of these designs, the core is configured so that intake air goes through the part of the core that would normally be exposed to outside air flow (yellow arrow), and the water goes through the passages that were previously reserved for the intake air (red arrow). So if you want a reasonable volume of water to be in the heat exchanger, you need to look carefully at the design of the commercially available unit. We suggest that units that contain a greater volume of water are the ones to go for. To reduce pressure drop (i.e. flow restriction) you in turn go for a core that has a lot of connecting passages for the induction air. If you look carefully, you’ll find a number of factory air/air intercoolers that have these specs. (Discarded factory intercoolers are cheaper than aftermarket ones.) My favourite is the intercooler fitted to twin turbo Toyota Soarers – these are unusually thick and so flow well in a compact size. This one cost me $20 plus postage. Turning such a core into a water/air heat exchanger involves cladding the core with aluminium panels, and then adding water fittings. Even if you have only a basic home workshop (and so for example don’t have TIG welding capability) there’s nothing to stop you cutting the panels to size and then taking them to a welder for finishing. Cutting the aluminium panels can be achieved with an electric jigsaw, or even a wood-cutting circular saw. In both cases, use plenty of spray-on lubricant. 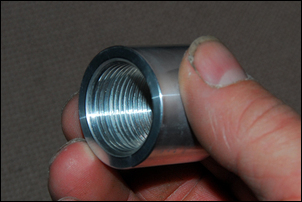 You can now buy on eBay weld-on aluminium spuds designed to take threaded hose fittings - these can also be welded into place. Pressure-test the water jacket to make sure that it actually does seal, and make sure that the water flow from one hose fitting to the other can't bypass the core. Small baffles can be used to ensure that the water does fully circulate before exiting. In addition to enclosing an air/air core, there are other ways of producing your own heat exchanger. A company called Laminova makes an interesting heat exchanger. 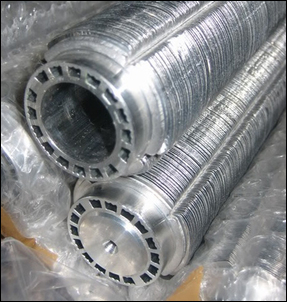 The heat exchanger core comprises an extruded aluminium tube with a huge number of very thin fins formed around the outside. The induction air passes through these fins while the water passes through small, longitudinal passages located adjacent to the fins. A central bypass tube can be used to regulate how much water passes through the small passages. Note how there is a lot of water contained within the core. 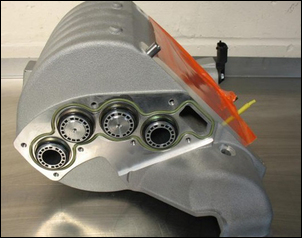 To effectively use these heat exchangers, a dedicated housing needs to be made – here a factory set-up integrates four Laminova heat exchangers into an intake manifold. Another approach is to use a copper tube stack. 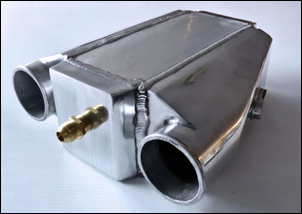 These small heat exchangers are normally used to cool boat engine oil, exchanging the heat with engine coolant or river or seawater. 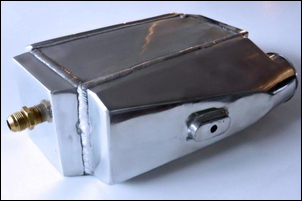 While the complete unit uses a cast iron enclosure and so is too heavy and large for car applications, the core piece itself can be enclosed to make a very efficient heat exchanger. Comprising a whole series of small-bore copper tubes joining two endplates, the core is cylindrical in shape and relatively easy to package. The induction air flows through the tubes while a water-tight sheet metal jacket can be soldered or brazed around the cylinder. The one here is shown installed on a car undergoing fuel pump testing. 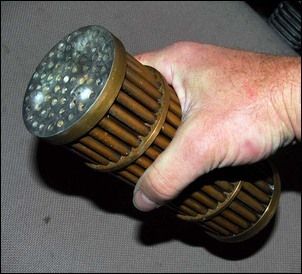 Note: it is also possible to configure the copper tube stack like the Laminova cores, with the induction air passing around the tubes rather than through them. 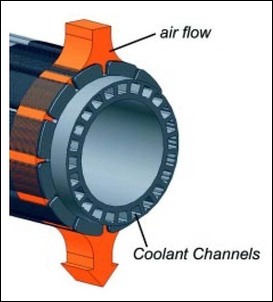 Water/air intercoolers have significant advantages over air/air designs. 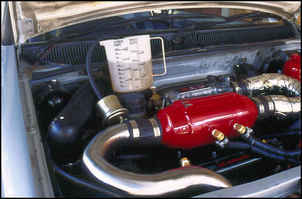 If the engine bay is small, and fitting in a large air/air core (and its associated plumbing) would be difficult, the advantages of water/air becomes even more pronounced. Water/air heat exchangers can be bought off the shelf but they are relatively limited in their configurations – overall size and shape, amount of water contained within the heat exchanger, and the size and location of the plumbing fittings. Making your own water/air heat exchanger is quite achievable and this allows you to configure the design to suit your exact requirements.